Grades 9-12 or equivalent age (which must be indicated on 3″ x 5″ card as well as mss). Three poems per entry. One poem per page. One page poems only, please. I am drawn to vivid imagery through word choice and where applied rhyme that rings true (not forcing words into the verse). Look for the ability to succinctly capture an emotion, and a little shock value, used sparingly. 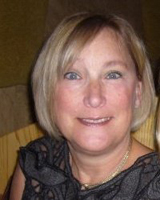 SANDY CARON (Los Altos, CA) supports her reading habit as a hospitality consultant, in a company co-owned with her husband. She has been a member of a peninsula book club for over 11 years, and finds bliss through the discovery of new authors, and sharing good material with friends. As an angsted teenager, she indulged in bouts of self-involved poetry, and believes she will be able to identify with all of the subtle messages relayed in the poems submitted by the Young Adults.